I’m not a big fan of the standard veggie and dip platter at parties. If I’m at a party I don’t want “diet” food, I want to splurge a little! I know many people feel the same since carrots and celery always seems to be the last stuff eaten. However, with all the entertaining I’ve done over the years as a Navy wife, I’ve found people love antipasto platters. Along with cheese, olives, cured meats, marinated mushrooms, artichokes, etc., I like to put a few different grilled veggies on my platters. Grilled asparagus, eggplant, and zucchini…whatever I’m in the mood for. I’ve also learned that party guests enjoy hand held food like skewers. So, for my last party I decided to combine my love for antipasto platters and skewers with these Antipasto Skewers. 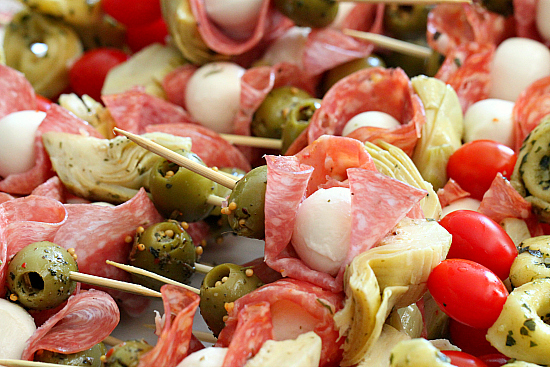 Anything you put on an antipasto platter can be cut up and skewered. For these skewers I decided I wanted something easy to prepare so I chose not to grill any vegetables. Everything was store bought which makes this a very simple appetizer to throw together. I bought olives from the olive bar at the grocery store, a variety pack of salamis, grape tomatoes, marinated artichoke hearts, little balls of mozzarella cheese and cheese tortellini. I used my favorite pesto (homemade) on the tortellini but you can certainly use store bought as well. Next time you’re looking for a big, beautiful platter of something for an appetizer forego the “diet” plate and give these Antipasto Skewers a try. And use your imagination, you can skewer almost anything! Cook tortellini according to package directions, drain and toss with pesto sauce, set aside to cool. Drain but do not rinse artichoke hearts and set aside. Drain mozzarella balls and set aside. Assemble skewers with a piece of each ingredient. I like to wrap the salami around the mozzarella ball. Order doesn't matter but it's nice to have colors alternate.